Guatemala: FIESTA OF SANTO TOMAS (Dec 22-25). Celebrated by the Chichicastenango Indians. Features the flying-pole ceremony: A pole made from a tall pine is consecrated & erected in the village. Platforms & ropes are attached, dancers climb to the very top &, attached to ropes coiled around trees, they fly into the air in ever-widening circles. 1440 -- The pirate Bluebeard is executed. 1639 -- Jean-Baptiste Racine, dramatic poet, lives, La Ferte-Milon in northern France. 1731 -- TaxOnAMe?! : Dutch people revolt against meat tax. 1796 -- England: William Smith, father of modern geology, is elected a member of the Bath & West of England Society. 1815 -- México: Jose Maria Morelos dies. Mexican revolutionary priest executed by Spaniards. 1839 -- John Nevil Maskelyne (1839-1917) lives. Maskelyne was one of the great British magicians, particularly stage illusions created through sleight of hand. Maskelyne teamed up with the legendary magician David Devant (1868-1941), considered the greatest stage illusionist of the era. Maskelyne & Devant published Our Magic in 1911, one of the definitive works about the theory of magic. The first typewriter to be manufactured in Britain was designed by Maskelyne. 1849 -- Fyodor Dostoevsky is led out for execution, then pardoned at the last moment. Dostoyevsky & his comrades in the Petrashevsky Circle were sentenced to death for 10 minutes. Time flies when you be having too much fun. "We say outright: these are madmen, yet these madmen have their own logic, their teaching, their code, their God even, & it's as deepset as it could be." 1859 -- Poet & prose writer, Manuel Gutiérrez Nájera lives, México City. His first article appears in the newspaper La Iberia when he is 13, & he contributes several articles a week until his death in 1895. 1869 -- Poet Edwin Arlington Robinson, lives, Head Tide, Maine. 1872 -- Italy: Ettore Bonometti, anarchist militant, lives (1872-1961), Brescia. Bonometti was first sent to prison in March 1892 where, to the delight of many — & the consternation of certain others — he regaled everyone with his anarchist songs & anti-monarchist views. Apparently, however, he must have won over his jailers, as they insisted on his presence numerous times, & he again graced Italy's jails in August 1892, November 1893, February 1894, & April 1895. They sought to have him back many other times over the years, forcing him into exile in France, England & Switzerland. He did end up back in prison in Italy during WWII, but was eventually allowed to live under "house arrest" — during which time he used his home for clandestine antifascist activities & the recruitment of fighters for the underground partisan movement. 1880 -- British novelist George Eliot (Mary Ann Evans) dies. 1882 -- Strung Out? : First string of Christmas tree lights created by Thomas Edison. 1883 -- Italy: La Questione Sociale begins publishing (weekly from Dec 22, 1883 to Aug. 3, 1884) in Florence. An anarchist-communist paper created by Errico Malatesta for, inter alia, fighting the parliamentarism now advocated by Andrea Costa. The editor, Pilade Cecchi, is busted in February & sent to prison for 21 months. A complete set of this paper is kept in the British Museum. According to Max Nettlau, La Questione Sociale was a remarkably large & well-made paper, with many contributors from all parts of Italy. 1900 -- US: Valerio Isca lives (d.1996). Italian-American anarchist, cofounder of the Libertarian Book Club. Paul Berman wrote a short piece about his friend, which appeared in Slate magazine in Sept 1996. 1905 -- Poet/essayist/critic/translator/anarchist Kenneth Rexroth lives. Influence on the spread of Beat poetry. Translated many Chinese & Japanese poets into English. "Rexroth loved jazz & knew the guys who played it, & translated poetry & drama from several languages, including classical Greek, Provençal French, & Japanese. He prided himself on reading the Encyclopedia Britannica cover to cover each year, & published more than a dozen books in his lifetime, including an autobiographical novel, & books of criticism on subjects ranging from contemporary poetry, to Hasidism, to Anarchism, to Zen. Rexroth's earliest poems sound remarkably like the work of the '80s "Language Poetry" school, abandoning photographic realism in an attempt to shed cliché & sentimentality. His mature poems, however, speak in language that is colloquial, sensual without being sentimental, calling forth the High Sierra granitescapes that Rexroth liked to make love in, with a crispness of image, a classical sense of balance, & elegiac gravity. Rexroth's apartment on Page Street was a library, its shelves lined with the heartwood of the classical literatures of East & West; & Rexroth had a caustic wit, & an ego, to match his erudition." At the Cellar Bar, Rexroth was crooning "Thou Shalt Not Kill" & "Married Blues," while a band riffed on "Things Ain't What They Used to Be." Jack Spicer hosted "Blabbermouth Nights" at a North Beach hangout called The Place, featuring performances by Richard Brautigan & John Wieners, with few prepared texts — the idea, as in jazz, was to burn — with the poets competing for door prizes & free drinks. 1907 -- England: Artist, book illustrator & anarchist Fermin Rocker lives (1907-2004). Wrote East End: A London Childhood (1992). Fermin Rocker's paintings convey the memory of his father, the famed anarchist Rudolf Rocker (see 1922, below, for example). Too modest to be called a working-class hero, Rudolf & his life-long companion Milly Witkop Rocker fought against the Nazis in Germany & militated with the workers in England & later in the United States. Fermin's powerful characters convey a sense of the conflicts & sufferings of the age, carrying their grief with dignity. 1908 -- Giacomo Manzù lives (1908-1991). Italian sculptor, printmaker, communist, & Roman Catholic. 1910 -- Colombia: Launching of the periodical Ravachol in Bogota. Founded & directed by Juan Francisco Moncaleano, one of a number of Colombians known in circles as the Anarquistas del Cono sur. The periodical quickly moved from a Liberal Socialist position to becoming a spokesman for anarchism, noting in one editorial, "We assumed with honor the name of a martyr for freedom." Its fighting program, published in No. 13, was a synthesis of anarchist ideals & concludes "Nobody has the right to govern to another person." Lanzamientoen Bogota, Colombia del periodico Anarquista "Ravachol," fundado y dirigido por Juan Francisco Moncaleano, uno de los mas insignes Anarquistas Colombianos, conocido especialmente en los circulos Anarquistas del Cono sur. El periodico evoluciono desde una posicion Liberal- Socialista hasta convertirse en vocero del Anarquismo, decia en una de sus editoriales " Asumimos con honor el nombre de un martir de la libertad," su programa de lucha publicado en el Nro. 13 era una sintesis de los ideales Anarquistas y concluia " Nadie tiene derecho a gobernar a otro"
1921 -- Latvia: Having left Russia disillusioned with the Bolshevik counter-revolution, on the train to Reval, Estonia, Alexander Berkman & Emma Goldman are arrested by the Latvian secret service & accused of being Bolshevik agents. They are detained for several days, preventing them from attending the anarchist congress in Berlin. 1922 -- Germany: International Congress of Revolutionary Syndicalists at Berlin. Founding of the anarcho-syndicalist International Workers Association (AIT/ IWA), on the initiative of Rudolf Rocker. Rudolf Rocker was responsible for putting together the anti-authoritarian A.I.T. ; it is an umbrella organization of various anarchist-syndicalist trade unionists from 12 countries (FORA, USI, SAC, FAUD, CNT, etc.) which numbered several million members over the years. The first secretaries are Rudolf Rocker, Augustin Souchy & Alexander Schapiro. 1934 -- Wallace Thurman dies in New York. Though closely associated with the Harlem Renaissance of the 1920s, he is accused by some of becoming a racial traitor with the publication of Infants of the Spring (1932), a satire of what he believed were the overrated creative figures of the movement. 1934 -- Bowl Me Over? : Miss Theo Trowbridge sets female bowling record 702 pins in games. This past weekend, in 1999, Nummer One Son receives two awards for YABA Greater Seattle City Championships: 2nd place for doubles (1,335; with his pal Jessan) & 3rd place for singles (729) (Division 55). 1937 -- Former hotel clerk/author Nathanael West ( Miss Lonelyhearts; Day of the Locust ), 37, & wife, Eileen McKenney — (heroine of Ruth McKenney's My Sister Eileen ) — killed during honeymoon in a car accident in El Centro, California. Acousmatics is the use of the "disembodied voice or sound" in the discovery of an alternative order....These sounds occasionally "intersect" the action in an ironic way. For example, when "Miss Lonelihearts," a bachelorette neighbor, unsuccessfully entertains a prospective boyfriend, an organ-grinder somewhere plays "That's Amore." "My books meet no needs except my own . . . I do it my way. The radical press, although I consider myself on their side, doesn't like it . . . & the literature boys, whom I detest, detest me in turn. The highbrow press finds that I avoid the important things & the lending library touts in the daily press think me shocking." 1937 -- England: Frank Ade jailed 21 days for war tax resistance. 1938 -- Emma Goldman travels to Amsterdam to organize Alexander Berkman's & her papers at the International Institute of Social History. 1942 -- US: Avalanche buries bus full of defense workers at Aliquippa, Pennsylvania. 22 die. 1943 -- Beatrix Potter, creator of Peter Rabbit, Jeremy Fisher Jemima Puddle-Duck, Mrs. Tiggy-Winkle, & others, dies, Sawrey, Lancashire. 1949 -- Concluding date in Georges Simenon's mystery novel L'amie de madame Maigret (1952). 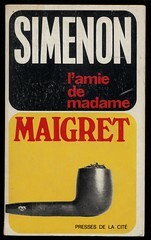 Many of Maigret's books were filmed by directors as diverse as Jean Renoir, Jean Delannoy, Bertrand Tavernier & Serge Gainsbourg. 1951 -- France: Georges Gillet (1875-1951) dies. Militant syndicaliste & propagandiste anarchiste, antimilitariste. 'Architecture for Life' an excerpt from Asger Jorn's book Image & Form , is published in Potlatch #15. 1956 -- Manuel Devaldès (aka Ernest-Edmond Lohy) dies. Anarchiste, pacifist & neo-Malthusian. Devaldes founded Revue Rouge in 1895, which included contributions from the "cultural terrorist" Félix Fénéon, Verlaine, Laurent Tailhade, etc. In 1912 he was involved with the group "L'action d'art," as were Gérard de Lacaze-Duthiers & André Colomer, publishing a review of the same name. Opposed to WWI, he found refuge in England which granted him conscientious objector (CO) status in 1914. Devaldes participated in many libertarian newspapers & reviews, & wrote several books & booklets ( La chair à canon (1908), Contes d'un rebelle (1925), La maternité consciente (1927), Anthologie des écrivains réfractaires (1927), etc). "En tout esclave consentant à sa servitude est un maître qui sommeille. Qui obéit volontiers à plus fort que soi est prêt à imposer à plus faible sa volonté." 1956 -- Italy: La cosiddetta giustizia di stato condanna il giornalista Manlio Cancogni e il direttore dell'Espresso Arrigo Benedetti a 8 mesi e 270.000 lire di multa per gli articoli (pubblicati nel 1956) che svelavano le connessioni speculative tra la giunta comunale di Roma e la società Immobiliare. Ancora una volta, ingiustizia è fatta ad opera dello stato. 1965 -- Cleaning House? : Henry House becomes first US soldier to be court martialed for protesting against Vietnam War. 1967 -- US: Got Purple Tums? Owsley busted in Orinda (stops production of acid). 1967 -- US: Radio Free Alcatraz broadcast for first time from Berkeley radio station KPFA. 1972 -- Vietnam: US again bombs the Bach Mai Hospital in the center of Hanoi, destroying it & allegedly killing 25 doctors, pharmacists & nurses. 1974 -- US: Hopi & Navajo Relocation Act passed by Congress to get those inconvenient Indians at Big Mountain, Arizona, away from lucrative coal deposits. Big Mountain families have been resisting this forced racial relocation ever since. 1976 -- High Seas: Worst oil spill off US coast — Liberian tanker off Nantucket. 1976 -- México: Martin Luis Guzmán dies in México City. 1977 -- US: Thomas Helms climbs to the edge of the observation deck on the 86th floor of the Empire State Building in New York City, & attempts to kill himself by leaping from the building to the street over a thousand feet below. However, the 26-year-old only falls 20 feet before landing on a narrow ledge. He suffers no major injuries but is knocked unconscious for half-an-hour — adequate time for an emergency crew to bring him safely inside. 1981 -- US: Let Them Eat Cheese? As Christmas approaches, Beloved & Respected Comrade Leader Acting President Ronnie Reagan authorizes the distribution of 30 million pounds of surplus cheese to the poor. According to a government official, the cheese is well over a year old & has reached "critical inventory situation." Translation: It's moldy. 1982 -- US: Congress passes first version Boland amendment (411-0) which prohibited covert efforts by the President to overthrow the Nicaraguan government. Will Reagan remember? 1984 -- US: No Tip? Bernhard Goetz, riding on NYC subway, shoots & wounds four African American teen-age boys after one of them demands 5 bucks. 1984 -- Koko, the gorilla who speaks sign language, cries at the news her kitten has died. 1988 -- Cease-fire announced by Angola, Cuba & South Africa in preparation for Namibian independence. 1989 -- Rumania: Beloved & Respected Comrade Leader Caescescu overthrown. Been living high on the hog while most people barely get by. 1989 -- Irish playwright/novelist Samuel Beckett dies, Paris, France. Comic writer, evoking laughter with his perception of humans as pompous, self-important, & preoccupied with illusory ambitions & futile desires. 1990 -- Trust Me? : Iraq announces it will never give up Kuwait. 1993 -- US: "Operation Toys for Guns" begins in New York City. 1993 -- Australia: Native Title Act restores some land & rights lost by aborigines. "Read Traven's jungle books," she exhorts, " Man of the Jungle, Bridge on the Jungle , all about the exploitation of Indians — & you'll learn a lot about what's going on [in Chiapas, Mexico] today." but come softly, on the feet of doves." of revolution, insurrection & upheaval. 2000 -- Ian Heavens dies (1957-2000). Scottish anarchist, co-founder of the punk/samba band Bloco Vomit. "Dancing at the Revolution" runs through today at the Theatre Cooperative, Somerville, Massachusetts. Michael Bettencourt’s historical drama examines the gritty trials & tribulations of radical activist Emma Goldman, who was tossed into prison, & then deported, for protesting America's entry into World War I. 2003 -- France: Bernard Voyenne (1920-2003) dies. Journalist, professor, Proudhonian & also a militant anarchist-syndicalist & federalist. During WWII Voyenne was a resistance fighter against the Nazis. A writer for Albert Camus' journal Combat , he was passionate about journalism & the French language. He began teaching at the "Centre de formation des Journalistes" in 1952, & eventually published 10 volumes on the history of the press & journalists, as well as producing an accessible version of Proudhon's memoirs. 2008 -- Iran: Police raid & close Nobel Peace Prize laureate (2003) Shirin Ebadi's Children's Rights Support Association prior to a planned celebration of Human Rights Day. Shirin is the first ever Iranian, & the first Muslim woman to have received the prize. In 2009, her award was allegedly confiscated by Iranian authorities. 2009 -- US: Cold Day in Hell? A police officer in Washington, DC, draws a gun during a snowball fight. Meanwhile, over in Poland, some 29 people freeze to death. 2009 -- Iran: Anti-government protests & clashes occur during the funeral of Grand Ayatollah Hussein-Ali Montazeri Najafabadi, a prominent scholar, Islamic theologian, Shiite Islamic democracy advocate, writer & human rights activist. "The line of least resistance was always the most difficult line in the long run."